Samaritan's Purse is a non-denominational Christian charity. Its program includes disaster relief for those whose homes have been affected by the 2014 flooding. Priority is given to the most vulnerable: seniors, people with disabilities or incomes, single parents, etc. 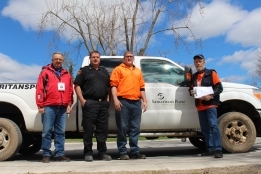 Today, Mike Broek, Municipality of Tweed Fire Chief, met with representatives of Samaritan's Purse and toured the flooded areas throughout the Municipality. If you would like to request a home assessment please call the local command centre at 613-210-0792. For more information please visit their website www.samaritanspurse.ca. This is a FREE service. Requests are being handled on a "first come, first served" basis depending on need and volunteer availability. If you or someone you know needs help with emergency clean-up assistance please contact Samaritan's Purse. If you would like to volunteer call the local command centre at 613-210-0792 to register. Be prepared to leave a voicemail message if the line is not yet staffed.